Monday, bought bread. Didn't shut the freezer door all the way (or it bounced back or something) and didn't realize it until 9:30pm on Tuesday night. All of our deer (approx. 40 pounds of ground venison, plus a box of waffles, some frozen blueberries, etc were all dethawed). We lost all but about 5 pounds of the deer, plus all the other stuff in there. AWESOME. Not to mention, the water was tainted with deer blood, so our garage and freezer now smell like a rotten meat locker. We have bleached, scrubbed, aired out and scrubbed some more. It's getting better, but still STINKS (Both literally and figuratively). To make a bad week worse, we realized this morning that our freezer on our fridge is not freezing. SO we had to call our appliance tech guy out today. I wasted most of the day waiting around for the tech, which frustrated me since the weather is absolutely gorgeous and we're pining away to get outside as much as possible right now. After a thorough evaluation this evening, the tech said that our fridge needs coolant. SO we have to wait until tomorrow to get the coolant replaced, which means everything that was in the freezer inside needed to go outside to our OTHER deep freeze (the one I did not leave open and that has 1/2 a cow in it). It's like musical freezers around here. I'm just praying this is the end to the series of unfortunate events around here. 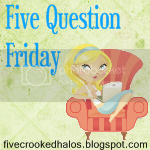 Since it's Friday, that means that it's time for Mama M.'s Five Question Friday. I finally like all of the questions this week, so it was fun to answer these! We have 1 pet... Toby the super dog. He's a Cairn Terrier, one of the best breeds of dogs out there. We like to say he has the heart of the lion but the body of a mouse, which isn't completely true, since he weighs in at 18 pounds (might be more now that he gets grilled cheese sandwiches and bites of hot dog from B-man!). He is SUPER compliant, LOVES people and other dogs, and would probably play fetch until he wore his paws off (he's actually done just that before, so we have to be careful... he has a REALLY high pain tolerance we've decided. What is it about my kids and high pain tolerances?!?!). Well, I like my life a whole lot, so I am not really sure how to answer this question, especially with the thought that it would mean I wouldn't have Drew and Brayden. Sometimes I wish I could change places with Connor. I mean think about it... he's warm, cozy and gets everything he needs right there in my belly. Plus, he's completely innocent... doesn't know what it feels like to be hungry, have a dirty diaper or deal with all of the drama in the world. 3. What is your favorite money saving tip? Don't make rash decisions. A lot of the poor financial decisions we make are ones that are made out of emotions rather than well thought out plans. Drew and I rarely, if ever, make decisions without praying about it and thinking about how it will impact us days, months and years down the road. Doing this will keep you out of a lot of trouble and heart ache. Happy. No seriously, I want them to do what makes them happy. Within reason of course, since life isn't always a walk in the park. I want Brayden to do something that makes him feel complete and accomplished. I don't want to put pressure on him to be something because Drew and I like it, but rather something that he truly has passion for. I think that our society places too much parental pressures on children and you have parents who are trying to live vicariously through their kids. That only makes the parents AND the kids miserable, in my humble opinion. "The best minds are not in government. If any were, businesses would hire them away." "I believe that for the sake of the Kingdom, we must despise apathy more than we fear failure."